Have a quick question? Chat with us live or Contact Us. We provide pickup and drop-off service anywhere in the city. Affordable payment options available. Contact us for details. If you are suffering from tooth ache, foul breath, cavity, yellow teeth then there is a chance you need a minor dental surgery and the best doctor in Vadodara for these surgeries is Dr. Abha Rana. → We , in Genuine Dentistry, believe that all are special in their own unique way and have their own specific health requirements. → Precise and complete oral diagnosis is the pillar feature in Genuine Dentistry that gives us the opportunity to help you deal with your dental health precisely and perfectly. → This is the most important and the most neglected and misinterpreted aspect of dentistry. The tissues in the oral cavity are so much interlinked that dental pain is most likely misdiagnosed. → We , in Genuine Dentistry , are a group of specialist doctors trained for different therapies . we work as a team to provide the best possible treatment and care to the patient. We offer our patients, a variety of treatment plans and they can choose according to their need and convenience. We ( me and my wife ) are highly thankful to you, for giving excellent treatment regarding gums... My wife Kantaben says that...," the surgery done by Dr. Abha is the best and so soft that I can't find any pain.. We wish all the best and fine progress to Dr. Abha." At Genuine Dentistry, I underwent root canal for aching teeths and bridge installment for missing teeth on both side. My wife Lata also got removed the aching wisdom tooth at Genuine Dentistry. We appreciate the Dr Abha Rana's caring approach, skills and efficient treatment with latest instruments which gave us complete relief for our teeth pains. We will like to give 10/10 to Dr Abha and her team of Genuine Dentistry and recommend Genuine Dentistry for any issues related to teeth. I am a patient of chronic periodontitis and my teeth were in a precarious condition when I first consulted Dr Abha Rana. After scaling and the subsequent flap surgery, condition of my gums has really improved a lot. Periodontal treatment also requires continued periodic monitoring, evaluation and care after the surgery. So the doctor-patient dynamics plays an important role in the ultimate outcomes. I would like to sincerely thank you for all the wonderful treatment you have provided. I can recall the first time I met you with reference of Dr. Kalpesh Patel. Immediately you examined and explained me about gum surgery in detailed. Really you performed surgery very well .During surgeries you&your staff were so friendly which made me feel comfortable.After the surgery, you had administered and monitored my gum & teeth in regular intervals. This demonstrates your commitment to your patients. Dr. Abha Rana is very intelligent and highly skillful dentist. She and her team are very friendly and gave very high standards of service and care throughout my dental operation and treatment. Single Visit Root Canal Treatment: What’s the Fuss About? Book an appointment for healthier and happier gums. Cleaning teeth or ultrasonic scaling is the most important and essential treatment to prevent and/or treat gum disease. Since the 1960s, it has become clear that dental bacterial plaque or what we commonly know as tartar is the primary agent causing periodontal (gum) disease. Cleaning to remove hard deposits accumulated on teeth is generally known as scaling. The newer terms “non-surgical periodontal therapy” and “periodontal debridement” more accurately reflect the newer treatment goals of dental hygiene with a primary emphasis on disrupting bacterial plaque biofilms while minimizing damaging the root structure during calculus removal (Calculus or tartar — calcified bacterial products that collect and attach to the tooth and root surfaces). In other words, these new treatment options enable your doctor to remove the tartar and biofilms from your teeth with minimal-to-no damage to tooth roots — a critical step to arrest periodontal infection and maintain good oral health. The use of power scalers began in the late 1950s when it was apparent that ultrasound could effectively remove deposits from teeth. From their initial use in removal of supra-gingival (“supra”–above; “gingival”–gum level) to their current application for the removal of supra and sub-gingival (“sub”–beneath) calculus, plaque biofilms, and bacterial byproducts, research has shown power scaling to be a very efficient tool. Most periodontal experts agree that the best results for non-surgical therapy are achieved by combining the use of power ultrasonic scalers and medications. Rapidly changing technology has revolutionized periodontal therapy with an integration of power scaling techniques resulting in improved clinical outcomes, patient comfort, and reduced time and physical demands on clinicians. We, in Genuine Dentistry, have ultrasonic led light optimized scalers that provide the best cleaning with proper illumination. Root canal treatment…..when, how, and why? Root canal treatment is needed when the pulp becomes inflamed or infected. The causes could be deep tooth decay, repeated dental procedures on one tooth (replacing a large filling, for example), or traumatic damage such as a crack, chip or even a root fracture. Gum disease can also give rise to root canal problems necessitating root canal treatment. Any of these issues can result in acute inflammation of the pulp, which may cause swelling and pressure inside the tooth (that has no outlet), leading to tooth pain and, eventually, irreversible damage to the pulp. Once the pulp dies, the pain may subside initially, sometimes to return as an acute (painful) infection spreading into the periapical tissues (“peri”–around; “apex”–end), particularly the bone. It could also become a chronic (long-standing) infection with symptoms ranging from mild to severe. In order to make a proper assessment and accurate diagnosis of which tooth is affected and exactly what is causing the pain, a thorough history and examination are necessary, together with a radiographic picture (x-ray) of the tooth or area. With the help of specialized instruments, the pulp and the canals are cleaned. We in Genuine Dentistry, use rotary instruments to reduce the time taken for the treatment and to reduce patients discomfort and visits. The canals are then irrigated with cleansing solutions and disinfected thoroughly. Almost like the root system of a plant, the root canals of a tooth have the main branch and many smaller side branches, and the whole system needs to be sealed during root canal treatment to be a successful long-term. This sealing is done with the root canal filling materials. Since root canals are very small spaces, they require a great deal of precision and care to treat well. Therefore, we in Genuine Dentistry, use state-of-the-art technology including digital (radiographic) imaging to diagnose root canal problems, and after treatment to verify that the canals are properly sealed; ultrasonic instrumentation to remove old canal fillings and posts and clean canals. Root canal treatment really does relieve pain, not cause it — and saves teeth. Digital radiography makes the treatment more accurate. Rotary instruments to reduce time and number of visits. Special robot-like devices to locate root apex and precise treatment. Painless treatment due to the use of anesthetic spray and thinnest gauge needle. Sometimes a tooth becomes so severely damaged due to decay, cracked teeth or trauma, that the area is too large to restore with a traditional filling. Such cases may call for a dental crown. One option for replacing missing teeth when other teeth (adjacent teeth) exists, is a bridge. Both crowns and bridges are fixed prosthetic appliances. Unlike removable appliances such as a denture, which can be taken out and cleaned daily, crowns and bridges are cemented onto existing teeth or implants, and can only be removed by a dentist. Both crowns and bridges fit completely over the affected teeth. To prepare for a crown or bridge, the tooth is prepared by being trimmed down (reduced) to accommodate the crown or bridge. The crown or bridge restores the size, shape and look of the tooth, and more importantly restores function. A dental crown, sometimes called a cap, completely covers your damaged tooth. It is cemented into place and offers a solid, strong, good-looking replacement for a natural tooth. A crown is created in the laboratory and is made from models the dentist makes with impressions, so that it fits properly, replicating the shape, size, and position of the severely damaged teeth. A bridge may be recommended if there are one or more missing teeth. They span the space where the teeth are missing. Bridges are cemented to natural teeth or implants surrounding the empty space. Gaps left by missing teeth eventually cause the remaining teeth to rotate or shift into the empty space, resulting in a bad bite. The imbalance caused by missing teeth can also lead to gum disease and TMJ disorders. You may need surgery for severe gum disease (periodontitis) if it cannot be cured with antibiotics or root planing and scaling. 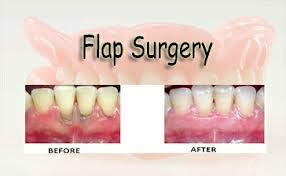 A flap procedure cleans the roots of a tooth and repairs bone damage caused by gum disease. A gum specialist (periodontist) performs the procedure. The doctor will pull back a section of your gums to clean the roots of your teeth and repair damaged bone if needed. The gum flap will be sewn back into place and covered with gauze to stop the bleeding. Repaired (grafted) with bone from another part of the body or with man-made materials. The doctor may place a Membrane on the bone graft to help the bone grow back. We, in Genuine Dentistry, perform this surgery with minimum discomfort assured. We use local anesthesia with the minimum gauge needle to assure almost painless surgery. Apart from this, we do have lasers, for those who are scared of taking needle pricks or surgery. The laser provides non-surgical therapy for gum disease and is a completely painless procedure. If you consider yourself somewhat of an anxious dental patient and are seeking extreme safety and comfort, you might consider looking for dentists who have incorporated laser dentistry techniques into their practices and treatments. 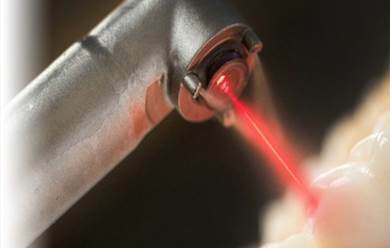 It is estimated that 6 percent of general dentists own a laser machine. We, in Genuine Dentistry, are trained to perform all kinds of soft tissue laser procedures. Tooth extraction is the removal of a tooth from its socket in the bone. If the tooth has been broken or damaged by decay, the dentist will try to fix it with a filling, crown or other treatment. Sometimes, there is too much damage for the tooth to be repaired. In such cases, the tooth needs to be extracted. Tooth extraction is relatively straightforward. The vast majority can be usually performed quickly using local anesthesia to eliminate pain. Some teeth are difficult to remove for several reasons, especially related to the tooth’s position, the shape of the tooth roots and the integrity of the tooth. Immediately after the tooth is removed, a bite pack is used to apply pressure to the tooth socket and stop bleeding. After the extraction, it is usually advised not to disturb the blood clot, avoid touching the area by finger or tongue, avoid vigorous rinsing or any strenuous activity. Smoking is also avoided for 24 hours. Full mouth reconstruction, full mouth rehabilitation, and full mouth restoration are terms often used interchangeably to describe the process of rebuilding or simultaneously restoring all of the teeth in both the upper and lower jaws. Full mouth rehabilitation is a dental treatment procedure that addresses and corrects poorly aligned jaws and worn, missing, broken or crooked teeth. Blending the science of neuromuscular dentistry with the artistry of cosmetic dentistry, full mouth rehabilitation creates smiles that are as beautiful as they are healthy and functional. Neuromuscular dentistry measures and determines the optimal position of jaws. Once determined, the jaw position is corrected with the help of a de-programmer. Later on, dental restorations including porcelain veneers, porcelain crowns or Onlays are done. After full mouth rehabilitation, you will have exceptionally strong teeth and beautiful smile. Full mouth rehabilitation seeks to re-build every tooth in the mouth and is skillful. Although the process can be extensive, the results are amazing. If you are conscious because you have missing teeth or wear dentures that are uncomfortable or don’t want to have a good tooth structure removed for a dental bridge, then DENTAL IMPLANTS is an appropriate option for you. Dental implants are a popular and effective way to replace missing teeth that are designed to blend in well with your other teeth. They are an excellent long-term option for restoring your smile. Dental implants have changed the face of dentistry over the last 25 years. A dental implant is actually a replacement for the root/roots of a tooth. Like the tooth roots, dental implants are secured in the jaw bone and are not visible once surgically placed. They are used to secure crowns, bridgework or dentures by a variety of means. They are made of titanium, which is light-weight, strong and biocompatible, which means that it is not rejected by the body. Titanium and titanium alloys are most widely used metals in both dental and other bone implants such as orthopedic joint replacements. Dental implants have the highest success rate of any implanted surgical device. Titanium’s special property of fusing to the bone, called “osseointegration”, is the biological basis of dental implant success. That’s because when teeth are lost, the bone that covers those teeth is lost too. 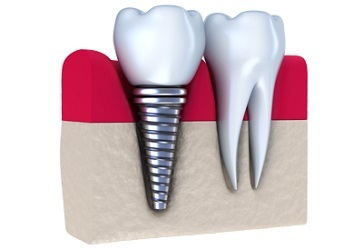 Placing dental implants stabilizes the bone, preventing its loss. Along with replacing lost teeth, implants help maintain the jaw bone’s shape and density. This means implants also support the facial skeleton, and indirectly the soft tissue structures – gums, cheeks, and lips. The importance of your smile cannot be over-stated – it’s the first thing that many people will notice about you, can leave a lasting impression on strangers and friends alike and plays a key role in your confidence and self-esteem. One of the greatest things that have attracted people to each other is a radiant smile. In other words, a smile speaks to your personality, appeal and confidence levels which take you the long way in life and career. The smile makeover is the process of improving the appearance of the smile through one or more cosmetic dentistry procedures, such as dental veneers, composite bonding or teeth whitening. We, in Genuine Dentistry, believe that all are special in their own unique way and have their own specific health requirements. Precise and complete oral diagnosis is the pillar feature in Genuine Dentistry that gives us the opportunity to help you deal with your dental health precisely and perfectly. This is the most important and the most neglected and misinterpreted aspect of dentistry. The tissues in the oral cavity are so much interlinked that dental pain is most likely misdiagnosed. We, in Genuine Dentistry, are a group of specialist doctors trained for different therapies. we work as a team to provide the best possible treatment and care to the patient. We offer our patients, a variety of treatment plans and they can choose according to their need and convenience. Since we know that fear of dental treatment is amongst first 5 fears in the world, We aim at giving a very comfortable and pleasing environment for our patients. We provide options for their choice of music being played during long treatment schedules. For precise diagnosis, we have facilities for intraoral photographs and digital x rays. This would help you see your own teeth on the screen and further help you to judge treatment options. Our specialized equipment topped with expertise and knowledge makes any dental procedure a pleasant experience. We do believe that your health, family and hard earned money are your greatest assets. We take utmost care of you and your family in the most affordable way. We use the dental products of the best brands, thus you can b assured for the quality of the material too. 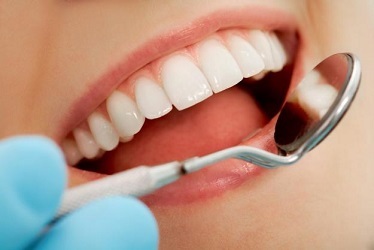 We, in Genuine Dentistry, follow a strict sterilization protocol so as to avoid cross infection. We use disposable consumables of the best quality. All the instruments are autoclaved in a sterilized pouch as autoclaving is the best available method to sterilize instruments. We are very thankful to our patients and the doctors who believe in us and help us taking oral health one step higher than what we started with. Making the decision to receive any type of treatment takes a lot of time and consideration. We are here to help you make the right decision. Developed by Troot Technologies LLP.